Photographing the cockpit of the Douglas Dauntless aircraft. I ARRIVED A BIT EARLY in Munda, a town in the Solomon Islands’ Western Province. I checked into the Agnes Gateway Hotel, then walked the short distance under triple-canopy tropical shade from my cabana to SIDE Dive Munda, behind the check-in building. Although my dive booking was not until the following day, I was eager to get under water ASAP, if at all possible. I gave Jos my cabana number and asked him if he would drop by to let me know, one way or another. Then I headed to the adjacent hotel restaurant patio to order lunch, before heading back to my digs to prepare my kit. Between bites of delicious grilled reef fish and UK-quality chips, I carefully assembled cameras, strobes and other requisite paraphernalia before lying down for a quick cat-nap. I guess the jet lag of 36 hours’ travel had finally caught up with me. “No worries!” I assured him. “This afternoon would have been a bonus dive anyway.” But missing the dive would mean yet another night of anticipation and fitful sleep, especially after crashing hard in the afternoon. And it was a restless night. Visions of WW2 wreckage and pastel-coloured reefs adjacent to emerald islands set between ribbons of aquamarine and indigo waters assaulted my subconscious. It was a night of a “thousand naps”, leaving me in a granny-knot of sheets by daybreak. MY NIGHT VISIONS were not without merit. The nation of the Solomon Islands, named by Spanish navigator Alvaro de Mendana in 1568 after the biblical King Solomon, and in the mistaken assumption that the islands contained great riches, is indeed wealthy on many levels beyond gold and gemstones. The nation’s cultural history is amazing, from its 74 endemic languages to the practice of head-hunting between rival warring tribes for power, politics, influence and overall good juju. It was believed that it was necessary to carry a victim’s head on the maiden voyage of a canoe to prevent jinxing it (tamu garata). This, of course, was before the intervention of Western missionaries in the early 20th century. 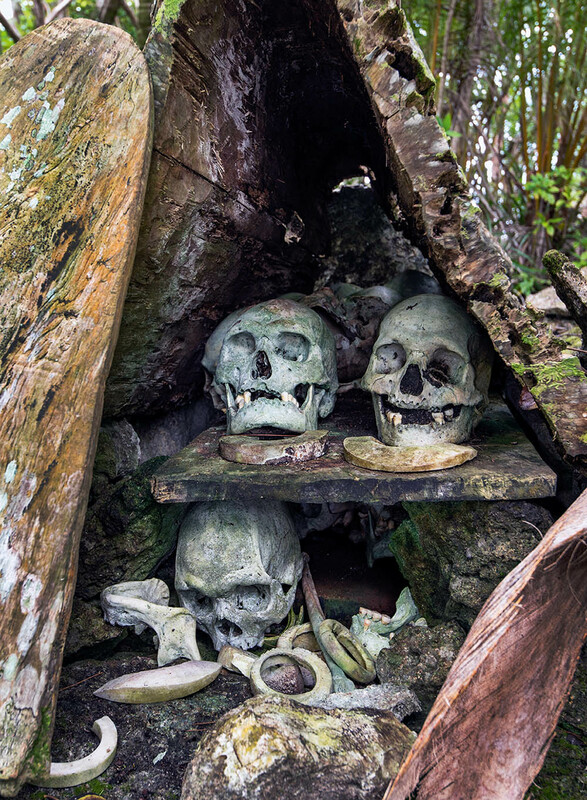 A small number of skulls of former tribal leaders and vanquished enemies not destroyed in the war have been preserved at sacred Skull Island, in Roviana Lagoon, in shrines decorated with traditional shell money. Next, consider the geography. The Solomon Islands archipelago stretches north-west to south-east some 930 miles, just below the Equator between the Coral Sea and the south-western Pacific Ocean. With a total landmass of 11,000sq miles, the six major and 900-plus smaller islands generate substantial submarine real estate in the forms of plunging walls, dynamic fringe, coastal and barrier reefs, bommie-filled lagoons and reef-ringed submerged atolls. And, with the Solomon Islands fitting into the innermost ring next to the bulls-eye of marine biodiversity in the Coral Triangle, riches await divers in the nation’s underwater realm. 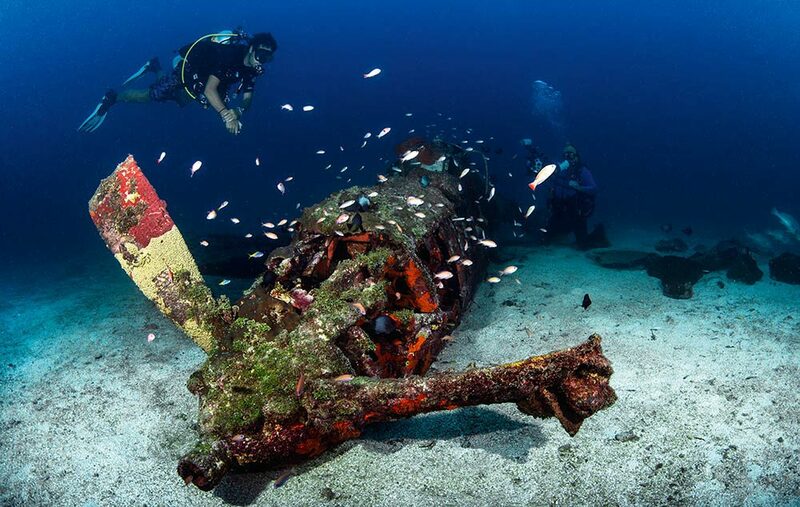 Finally, ponder the amazing wealth of historic wreckage from WW2 found throughout the country. Fierce battles fought between the USA and its allies against the Japanese Imperial Forces from 1942 to 1945 left many aircraft, small boats, freighters and warships sunk in water shallow enough to explore on open-circuit scuba rigs. a week in the Western Province diving out of Munda, and another in the Eastern Province’s Florida Islands (the subject of another story to come). 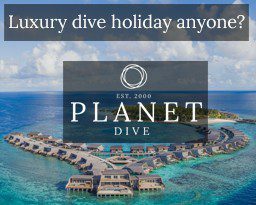 Additional options include two liveaboards out of Honiara, the capital on the largest island, Guadalcanal in the Eastern Province. I AMBLED DOWN to the restaurant deck overlooking a smooth Roviana Lagoon. It was still too early for everyone, including the water-taxis that are the optimum transportation among islanders and tourists alike. The sun was high enough for me to peer into the shallow water below the deck, and I considered finding a giant carpet anemone hosting a family of clownfish a good omen. I met Jos at the dive shop. With a large group of divers just departed it would be only me, Jos and another diver from Australia for the next several days. SIDE has established more than 40 dive-sites within 5-40 minutes’ boat-ride, and the evening before I had given Jos my critter and wreck wish-list. 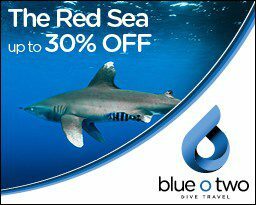 To start he had selected Shark Point, a spur of barrier reef extending into deep ocean on the seaward side of the expansive Roviana Lagoon. 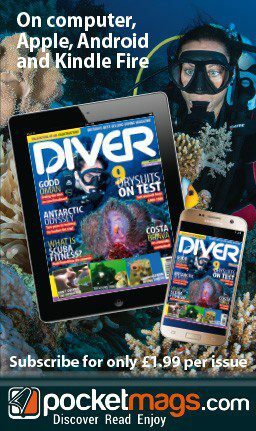 We began the dive at 30m along a vertical wall festooned with jumbo seafans in a variety of colours, and followed the sweep of the current to the point. Almost immediately we were visited by a grey reef shark, perhaps the largest I’d ever seen, but it kept a typical arm’s length away, preventing a good image with my wide-angle kit. As we approached the end of the spur, the wall began to slope gently and the seafans gave way to colourful tabling corals, competing for limited space. 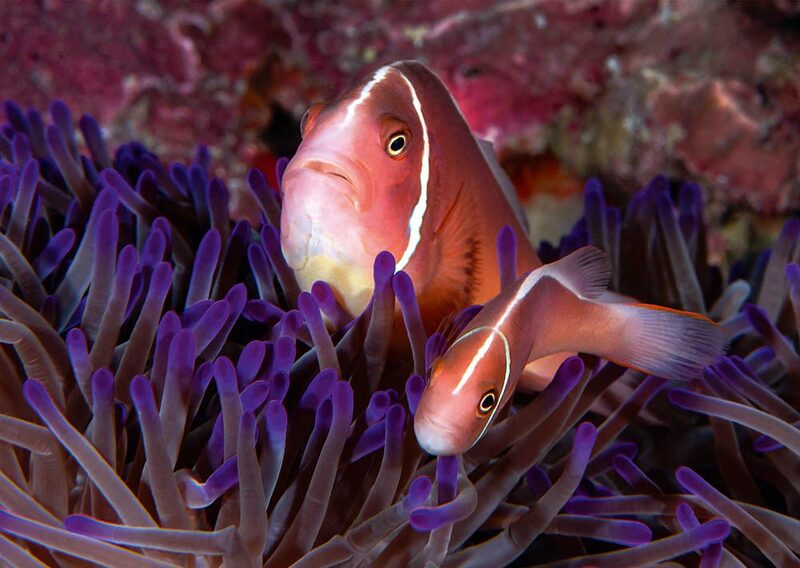 I noticed a large magnificent anemone hosting a pair of pink skunk anemonefish, more suited to my camera set-up. As we dived on through the day, I racked up a satisfying collection of images that would keep me busy later at the computer – assuming that I could keep my eyes open. Our panga pilot navigated expertly around shallow brown and green bommies and over pearly-white sandbars between the islands of my dreams. Walt Disney could not have designed a better boat-ride in a tropical paradise. By 8.30am we rolled into a smooth clear ocean. I rode the light current down the deep canyon in the reef, paused to absorb the spectacular vista, then gently glided down over the lip of the outer wall into 300m of water. 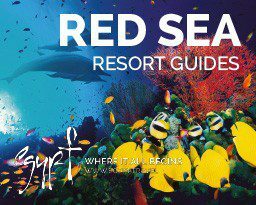 The dive was all Jos had promised, perfect for shooting sun-rays against a canyon backdrop of reef structure. If only my strobes could achieve the impossible energy required to illuminate the distant pastel vista that I knew existed at 20m. IT WAS LATE AFTERNOON by the time we had offgassed enough to dive Secret Spot but I struggled to find nudis in the low light and strong current. 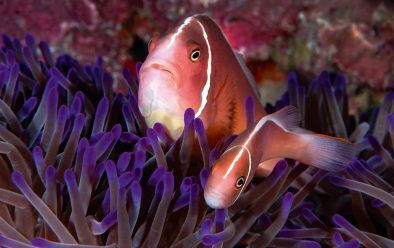 However, I was suddenly happy with the macro kit when I came across a rare purple-violet magnificent anemone with a pair of very pink skunk anemonefish. Purple-violet magnificent anemone with pink skunk anemonefish at Secret Spot. The mated pair posed perfectly, and I was congratulating myself when Jos pointed up to the reef crown at the top of the wall. There, in 2m depth, thousands of surgeonfish were beginning to spawn; rapidly rocketing up out of the vast school in small groups to milk the water with released gametes from both sexes. I shook my head in disbelief; I had the wrong kit, but simply enjoyed the spectacular display of raw biology until it was time to surface. Over the following days I worked through my wish-list, including the endemic white bonnet anemonefish. 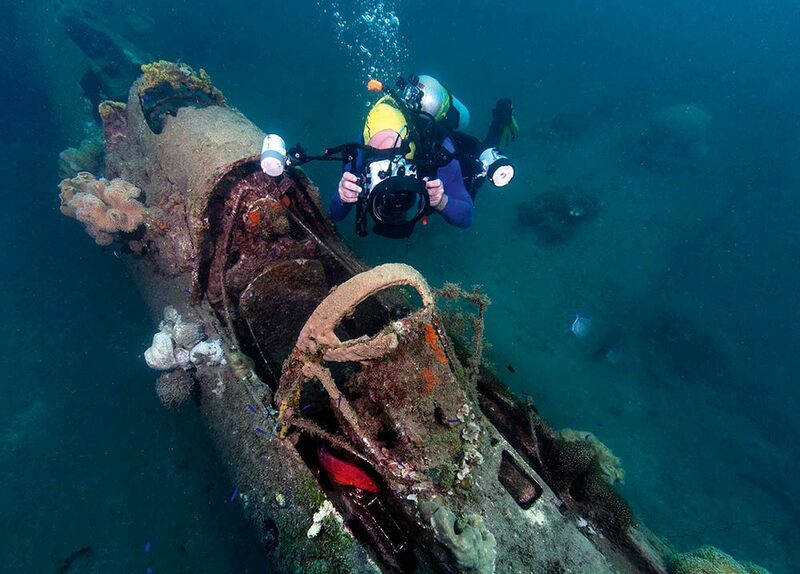 With a laptop flush with reef-work, it was time to dive a couple of aircraft shot down during WW2. Our final dives included the small aerial-combat P-39 Airacobra fighter and Douglas SBD-4 Dauntless dive-bomber. Discovered only in 2011, little is known about the fighter, which Jos believes was part of the USAAF 68th Squadron. It lies on a sandy bottom at 27m, in a relatively clearwater channel between two islands. An oasis of life in the otherwise barren channel, it remains photogenic with its propeller, cockpit, left wing and tail still intact. It was an excellent dive, and I surfaced contentedly. The Dauntless eternally rests in only 13m in Rendova Harbor. Japanese anti-aircraft fire caught it during an aerial raid on Munda in July 1943, but pilot Jim Dougherty managed to crash-land without casualties. In an amazing bit of follow-on history, he returned to Munda on the 50th anniversary of the battle and dived the wreck! (see Lost Warriors of the South Pacific on YouTube). I thought about Dougherty’s bravery and that of other aviators on both sides of the war as I descended through murky harbour water to the well-preserved wreck. At the nose I carefully settled to the soft bottom, avoiding a plume of silt, and waited for Jos to swim into the viewfinder. I assured him back aboard the panga that my mission was to make him a “rock star” with a magazine cover shot. We laughed at the notion and promised to keep in touch as we made our final return to SIDE and the Agnes under another Disneyesque sunset. THE FOLLOWING DAY I was catching a 5pm flight to Honiara for stage two of my Solomon Islands adventure, so had time to kill. I took a cab into the jungle to visit Barney Paulson, a local man who has collected artefacts for a semi-official WW2 museum in a shed beside his house. His collection includes everything from soldiers’ dog-tags to bayonets and light machine-guns. It was well worth the time to hear the fascinating stories about his wartime treasures. I then joined two women, an Australian journalist and a local professional from the tourism bureau, on a water taxi to Skull Island. The driver would not let us off the panga until he had completed an incantation that would ensure proper “permission” to visit the shrines without “incident”. Returning to the panga, the tourism bureau representative confided to the Australian that she felt “something bad” was going to happen. I had brushed off the concern as superstition, until my outer ear began to hurt on the way back to the hotel. By the time I was in the air I was in considerable pain, and worried about being able to dive. GETTING THERE> Fly from London to Brisbane, Australia, the gateway city to the Solomon Islands. Solomon Airlines has just started flying direct to Munda, saving a stop and a smaller commuter flight. Outbound departures still go through Honiara, but direct flights to Brisbane are planned soon. WHEN TO GO> Year-round. Rainy season is November-January but it usually just showers. There is always a lee site to dive if the wind blows. MONEY> SI dollar, credit cards widely accepted. HEALTH> A recompression chamber in Honiara is manned by volunteers but not always available – the nearest after that is 1500 miles away in Townsville, Australia. 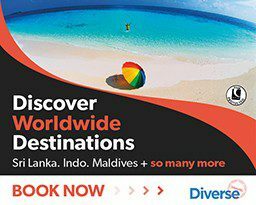 PRICES> Return flights from London to Munda around £1200. Three-tank excursion with lunch £137. A cabana at the Agnes Gateway Hotel costs £31 a day.